Back in 2008 I decided I’d have a go at compiling crosswords and, aiming high, I resolved to have my first published as a Listener before my 60th birthday. This is the puzzle that was going to realize that ambition for me. I started it soon after solving Sabre’s “Lip Service” (Listener 3981), an offering from the master featuring a code. Inspiration for sure, and I was thereafter determined that my debut also had to feature code. However, I also needed it to be something different, not the oft-used playfair or straight letter substitution – so I might face a challenge without resorting to a half-page preamble. My best option would be to find some way to let a third party describe the code, leaving me to just steer the solver to that party’s text – and I recalled an occasion twenty years earlier when I had been so directed. That occasion was when I read Alan Garner’s ‘Red Shift’. Clearly, finishing the main text of the book was no longer enough. There was no way to feel the experience was complete without decoding that letter. In those pre-internet days I found the description of Carroll’s cipher in a copy of his complete works, unearthed in Shoreditch Library. 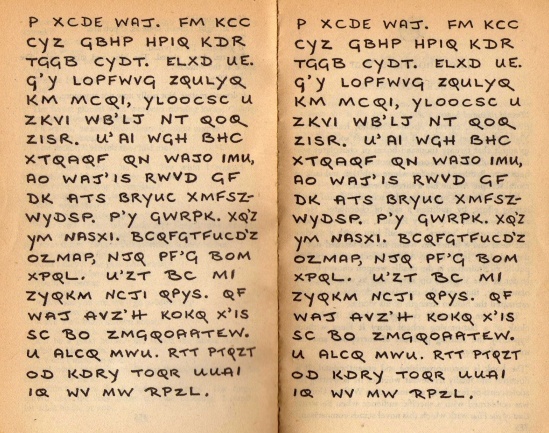 It’s not strictly his code – his 1858 article “The Alphabet Cipher” describes the Vigenère cipher. It needs a key word or phrase – and there was no explicit indication in the novel of the required keyword so I managed the deciphering by guessing a few of the words which might be in it, thereby back-identifying the key. 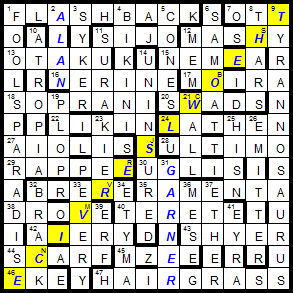 In the Listener puzzle, I clearly did have to supply a key and settled on ‘Alan Garner’, attractive because that would only oblige me to change 8 letters on the diagonal (despite that, still changing about 14 words to different ‘real’ words). I thought it would be neat to clue in a vaguely thematic way, so decided to try and ‘shift’ those words from the 18 across definitions – it worked not too badly even if there was a resultant forced look to the occasional clue. Thanks also to Roger, not just for vetting and tidying up the final article, but also for this link sent to me just after the puzzle was published. It seems that at the end of March, Alan Garner gave the inaugural Garner Lecture – as reported in the New Statesman on April 2nd, just 2 days away from publication of my Red Shift. As part of that lecture, Garner expanded on the various strands which had combined to influence his Red Shift. Aside from the above-mentioned, my thanks go to all who helped in preparation of the puzzle – plus of course John Green – and all who have provided most welcome feedback both directly and indirectly. Those who had not heard of Alan Garner did not seem unduly perturbed, maybe because the preamble had been modified from my original version – which gave away very little – to try and accommodate all of those likely to be unfamiliar with the theme. Although mention of the ‘13 letter title’ and ‘new words in the grid’ offered a shortcut, not too many availed themselves of it and most seem to have enjoyed solving the puzzle in the way I had hoped. It appears to have been a fairly well received ‘debut’ which at least appeared before my 65th. The best place to start here seemed to be obviously the downs, extra letters being not too hard to work through usually. And there were a couple of generous anagrams, too, to get us going, at 1dn FOOL’S PARADISE, 5dn CONES, and also 9dn TYRANNOSAURUS — and a few hidden words at eg 12dn MEM and 34dn ETYMA. All of which helped to get the grid-fill going and focus on those tricky-looking acrosses. Long story short, the grid-fill came first (and in general fairly quickly, with most of the remaining clues having fairly generous wordplays), and only then the sorting out of what words moved where. Nudd seemed to have some obsession with Eastern culture as SIJO, OTAKU and LIKIN appeared in the grid — and, as it turned out, that yokozuna word is a term for a particularly MASSY sumo wrestler. All of that juggling, though, and out popped the messages from the down clues “Decode Carroll cipher, NE to SW”, and “key is an author’s name”. Which author? Alan Garner, possibly… never heard of him, but wikipedia assures me that he wrote Red Shift so there’s the title link sorted out. No physics after all. But the disappointment doesn’t last too long as in its place wanders that ingenious cipher invented by Carroll. Well, actually not, but never mind (not even by de Vigenère, who I thought came up with it, but predates both by about 300 years). With enough text it’s relatively easy to break, but the principle is nice — essentially, it’s just a shift cipher, but different shifts on each letter over the length of the keyword. A quick check to make sure that you use the whole keyword ALANGARNER and not just the unique letters ALNGRE or something, and then I mock up the code, decode the NE to SW diagonal, get “theowl”, find that Alan Garner also wrote The Owl Service and we’re done. May as well finish the decoding anyway, and indeed it does work, producing a new set of real words. Luckily for Nudd, ALANGARNERALA as a key has the lovely advantage of not changing five letters, meaning that he only needed to find eight words/ word pairs that fit, but still a tricky thing to make work I can well imagine. So well done Nudd for that, and a fine construction all the way through, everything linking together at the end. For completeness: The across clue replacements are 7 inept ->13 obsolescent ->32 eastern->11 hybrid ->30 amaryllis->16 Mozambican ->45 keen -> 7; 12 Urumqi -> 22 effort -> 46 appetite -> 44 yokozuna ->12; 15 nest -> 42 runway -> 38 seat ->15; 18 testimony <-> 29 notes; 20 armoured <-> 40 smooth. Shame it wasn’t a perfect 18-cycle, but never mind. Thanks Nudd. Nudd’s fourth Listener faced us this week, although he has had a fair few other thematics in the last five years. (And my crystal ball tells me that he’ll have an EV the week after this puzzle. If only predicting the lottery were as easy.) Anyway, two types of clue this week. 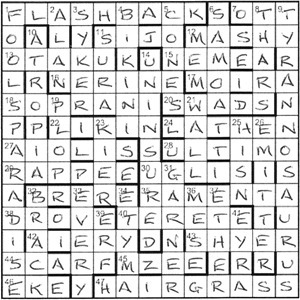 Eighteen acrosses suffered a fate we don’t see too often: a word has to shift from one clue to another before solving with their initial letters spelling out some key information involving two grid entries. Downs suffered the somewhat more mundane extra letter in the wordplay and would reveal an instruction. I decided to tackle the long down entries first in the left, middle and right columns. I was rewarded with the straightforward anagram at 1, ‘raps Delia’s foo[d]’ giving FOOL’S PARADISE, and the only slightly trickier compound anagram at 14 With introductions to Tolkien’s Lord, this ancient giant could make Sauron ultra-nasty (13), R in INJUN* in DUE[L]* for UNINJURED. The compound anagram at 9dn With introductions to Tolkien’s Lord, this ancient giant could make Sauron ultra-nasty (13) would have to wait until I got OTT at 7ac for me to see (TL + TYRANNOSAURUS)* = (SAURON ULTRA-N[A]STY)*. I must admit that I enjoyed disentangling the shifted words in the across clues, although we were spoilt in that they were limited to words in the definitions. Having repositioned them, I was relieved that they began to spell out something meaningful, finally giving Key is an author’s name. Assuming that this author wasn’t known by a nickname such as Flashback Emery, Hairgrass Rapper or Tyrannosaurus Massy, it didn’t take long to find ALAN GARNER at 2 and 31. Meanwhile, the down clues were giving an instruction to decode something. Despite initially making a total pig’s ear of the last six clues’ extra letters, this finally gave Decode Carroll cipher NE to SW. We’ve had the Caesar cipher before… and will have it again next week (more spooky premonition), but I’d not heard of Lewis Carroll’s cipher. In fact, the two are fairly closely related and probably the simplest of encryptions. Carroll’s is based on a key word or phrase (or name) which determines the offset for each letter to be encoded. The first thing to do, though, was to find out more about this chap Alan Garner. Seems like he’s an author of children’s fantasy novels, one of which is Red Shift. At least the title confirms that I’ve got the right Garner. Moreover, Wiki tells me that one of the titles has 13 letters, The Owl Service, and it doesn’t take long to confirm that the NE–SW diagonal does indeed become that when decoded. All in all, an entertaining puzzle from Nudd, although I’m not tempted to read the books. There were some nice clues on the way. My favourites were 1dn Sadly raps Delia’s food — “it’s heaven but based on false hopes” (13, two words) (although slightly unfair on Delia perhaps), and 10dn Bagpipe tune played back in melody — this is poisonous (7)… which is nowhere near critical enough of bagpipes! How reassuring to read a preamble that we could, at once, understand (even if that last little parenthesis ‘the next key title features this technique’ left us wondering). Of course, Nudd quickly confirmed his membership of the Listener setters’ oenophile club with his ‘Piece from Riga(female) stripped and ready to get plastered? (6) (which gave us LAT + HEN). There was need for a bit of alcoholic relief as the food in the clues was odd to say the least: ‘With great ‘appetite’, managed to make extract of native kelp (3) (we decided it was great ‘effort’ that produced the hidden EKE); ‘Sadly raps Delia’s food – “it’s heaven but based on false hopes” (13, two words) (That anagrammed to FOOLS’ PARADISE with an extra D) and ‘Order second ice creams (5) (another anagram producing an extra D). Solving was steady and enjoyable. We appreciated that after the tough clues that Shackleton provided a week ago and we were soon delighted to find that we had highlighted eighteen words that seemed to be in the wrong clue and needed to be rehoused. There was a little bit of puzzling there as we needed some word for SIJO, ”Hybrid’ verse form is returned by Lewis’s loved one (4)’ Clearly that was IS< + JO but Chambers told us that was a Korean verse form, and we were trying to place Urumqi, Mozambican and yokozuna. Fortunately, when we had located those with a MASSY person, a MZEE and LIKIN (an old Chinese duty), we were left with EASTERN for the SIJO and the initial letters of our extra words spelled out KEY IS AN AUTHOR’S NAME. The extra letters in down clues had given us DECODE CARROLL CIPHER NE TO SW, so, for anyone who has read Alan Garner’s Red Shift, there were two prompts leading us to what we now had to perform. ALAN GARNER was spelled out in 2dn and 31dn and we had that helpful title and hadn’t we been told that ‘the next key title features this technique’. Of course, teachers of teenagers know how popular his Red Shift and The Owl Service were and I didn’t really need to go to the Internet to download the alphabet grid to work out the decoding – but I did. NE to SW, we had TSEBCLJRVMINE. I overwrote that with ALANGARNERA and checked the appropriate columns and there, of course, it was, THE OWL SERVICE. What a totally satisfactory compilation this was with one title becoming the other and still maintaining real words. Many thanks to Nudd. 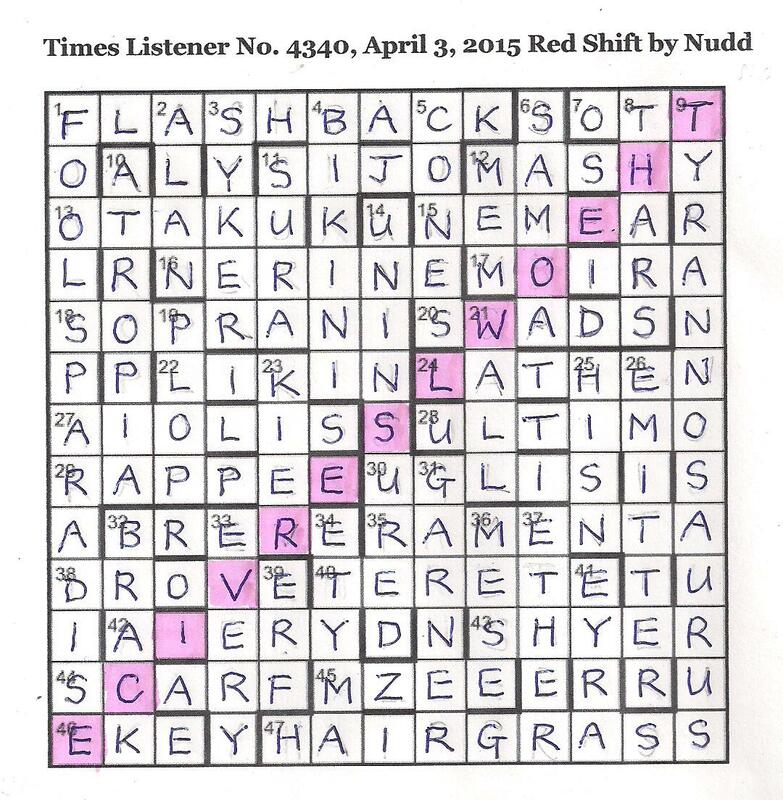 This was the first Listener crossword idea that I ever had; the general idea of creating the toughest small crossword, a Listener puzzle that solvers would struggle with, hopefully enjoyably, for several hours before realising at the end that they would be submitting an absurdly simple crossword as a solution (it is no coincidence that this puzzle appeared on the week of April 1st). One of the attractive aspects of this idea was that it would give our illustrious marker John Green a bit of a respite from his painstaking weekly task. My first attempt at creating such a puzzle was back in 2003, and the original dénouement was a 3×3. It took me forever to compose, was ridiculously complicated with a long preamble and far too many clues (and not very brilliant ones), was not thematically cohesive, and I believe would have been a real pain to solve with very little reward. Ross Beresford and Derek Arthur, who were the Listener editors at the time, manfully struggled through it. They rightly and thankfully rejected it of course, but Ross wrote a very kind rejection letter, giving some helpful pointers, and generally providing encouragement. Since then, I have learnt my trade as a Listener setter, how to take a theme and work on it so that it is cohesive and slowly revealed through the course of the solve, how to strive to simplify things, how to write reasonable clues, how to put myself in the solver’s shoes and provide good value for the work they have to do. I resurrected the idea in 2009, when the current 2×2 scheme emerged – I remember mulling over it during an extended work trip to the West Coast of the USA in 2009, during which I drove from LA to Seattle with a colleague; he was a captive audience as I sounded out the ideas, but fortunately he was also a receptive and encouraging one as he was an occasional EV solver. The puzzle was three times in the Listener queue. I substituted it on the first couple of occasions with date-constrained puzzles that needed priority. But on both occasions I took the opportunity to rejig the clues, so they were probably rewritten several times over before I was finally satisfied. There were a couple of wordings in the preamble that were designed to put the solver off the scent. The first was the wording “… the main diagonal (marked by blocks)”, which explicitly defined what a ‘block’ was (necessary later for the unambiguous interpretation of the instruction) but was also designed to misdirect the solver into a diagonal frame of mind. The second was the wording “in tandem” which precisely defined the structure of the clues, but which, in conjunction with the lines and circles, was also designed to deflect the solver’s thoughts to the song “Daisy, Daisy…”. There were also a couple of unplanned but unavoidable and in fact welcome red herrings in the grid. In particular, the MOTH that appeared so prominently in the more difficult fourth quadrant, and the ZOO that leapt out once the lines/circles had been drawn in the first three quadrants. With a carte blanche, my hope is always that solvers will use a combination of solving and pure logic to place the bars – I think that this is one of its attractions. In this case the distance 12 answers (whose clues were easier) could be immediately placed, and hopefully this provided a reasonable entry point into the puzzle. The unusual form of symmetry in Mixed Doubles also provided inspiration for the Mango puzzle Nuts and Bolts (Listener No 4260) written together with my Mango colleagues (the late great Roddy Forman, and Steve Mann), a puzzle that was written sometime after Mixed Doubles, but that appeared over a year earlier.